Armen Alchian, a UCLA professor emeritus of economics who played an influential role in his field for more than half a century and helped elevate UCLA’s economics department to one of the most respected in the country, died on Feb. 19 at his home in Los Angeles. He was 98. In a ceremony March 23 at the UCLA Faculty Club, a representative of California Assembly member Holly Mitchell (D-Culver City) presented his family with a flag to honor him for his dedicated service as a UCLA professor and World War II veteran. Alchian was known for groundbreaking research on the employee-employer relationship, the hidden inefficiencies of governmental regulation and the forces that determine the success of firms. “I’ve enjoyed working on problems in economics so much that it didn’t seem like work,” he said in 2009. Born on April 12, 1914, in Fresno, Calif., he attended Fresno State College in 1932 and transferred to Stanford in 1934. He obtained his B.A. from Stanford in 1936 and continued his graduate studies there, finishing his Ph.D. dissertation in 1943 on “The Effects of Changes in the General Wage Structure.” In 1940-41, he worked at the National Bureau of Economic Research and Harvard, and, in 1942, became an instructor at the University of Oregon. He served in the U.S. Army Air Forces from 1942-46 doing statistical work. In 1946, Alchian arrived at UCLA, where he became a full professor in 1958. He received numerous awards and honors over the years, and became a Distinguished Fellow of the American Economic Association in 1996. As the first member of the UCLA economics department to have a PC in his office, he was also an early user of email. Alchian, whose colleagues called him “the Armenian Adam Smith,” retired in 1984 but did not close his campus office until 2007. Alchian also had an 18-year affiliation with the RAND Corp., and became known for work that looked at the hidden costs of regulation. In a 1962 study of heavily regulated industries, for instance, he found employers less likely to hire well-qualified minorities. 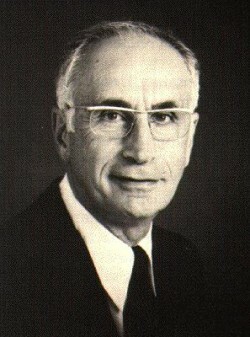 At UCLA, Alchian was known to his students, colleagues and others as the founder of the “UCLA tradition” in economics. This tradition, which continues to this day, emphasizes that individual behavior is self-seeking and “rational,” and that this has many unanticipated consequences. It recognizes that “rationality” is the outcome of evolution and learning, and emphasizes that frictions, such as uncertainty, act as brakes on an individual’s ability to make decisions and coordinate with one another. Generations of undergraduates also received their introduction to the field from “University Economics,” an influential textbook co-authored by Alchian in 1964 that eventually appeared in six editions. Alchian was also much appreciated by generations of graduate students, largely through his first-year course in microeconomics. His best-known student was William F. Sharpe, who received the Nobel Memorial Prize in Economic Science in 1990 for his work on finance. To read more about Alchian’s numerous achievements and honors, see this UCLA Newsroom story.